LegalArt is proud to present “Four Minutes, Thirty-Three Seconds” an exhibition by visiting curator Omar Lopez-Chahoud inspired by the 1960’s Fluxus Movement. 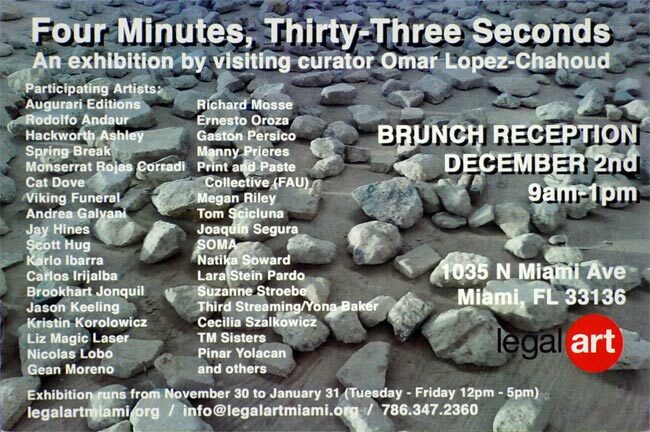 This exhibition will take place on the 2nd and 4th floor of LegalArt, with a reception on December 2nd from 9am to 1pm at the time of LegalArt’s “Art Basel Collector’s Brunch”. On December 2nd a series of panel discussions, performances and open studios will be taking place. See schedule below. 11:00am Ernesto Oroza: “Architecture of Necessity” The panelist talks about how Cubans intervene in architecture out of necessity and everyday survival in Cuba. 12:00pm Rodolfo Andaur: “Local Reality as Memory Desertification, Contemporary Art in the North of Chile” The Chilean curator talks about the political and geographical impact of art in the North of Chile.